Not sure if my list will change much next week for the new year...I may add to it, all the kits/projects with yarn, I've gotten the past couple of weeks.. I received no fibery goodness for Christmas...well I did receive these gloves from one of my besties.. 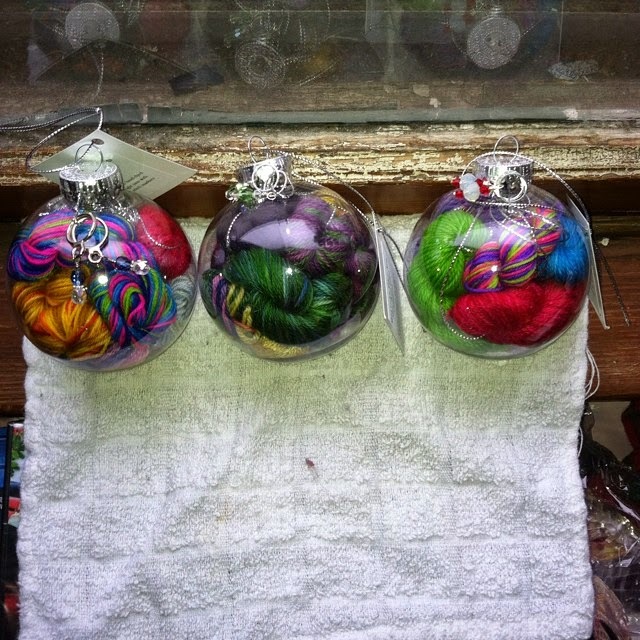 I purchased these fun ornaments from MadColor, I kept the one in the center and gifted the other two.. I'm all about the chunky yarnz now! I also spent some time buying a couple of Yarn-mas skeins from Jimmy Beans..
Edith's Secret - pink is not usually my thing, but I can do it in a variegate, both are Solemate. I commented about a friend's slippers on Facebook and she sent me the yarn from Norway to make my own! Two days of school left...and my mojo returned! So I have finished 5 Christmas gifts in the past 4 days...I have been working almost nonstop this weekend and my thumb is wrecked right now..I alternated between knit and crochet, but my right thumb still bears the brunt of the work and is achey right now.. I also worked for a bit on my Have I Ever Steered You Wrong? 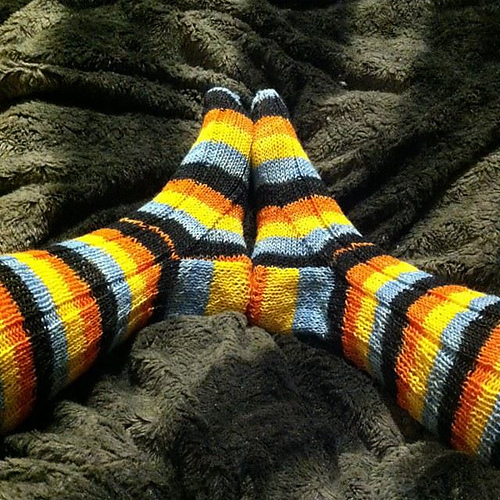 Socks....I'm on the leg and they fit the best of any socks I've made so far...maybe toe-up is the way to go? I've also received a bunch of new yarn....I'll show those sometime this week...and I'll be going on a somewhat yarn-buying embargo for the New Year....as I have plans to go to Norway!!!!!! I'm so excited...my penpal invited me to visit, so gonna go this coming summer, if all goes well....and she has already talked about visiting some yarn shops there, as she is a knitter and just getting back into it! So need to save my money for the trip....but will still stay in the yarn clubs.....I'm thinking I'll bring yarn over to gift to her..and that will leave a space in my suitcase for new yarnz...good plan? 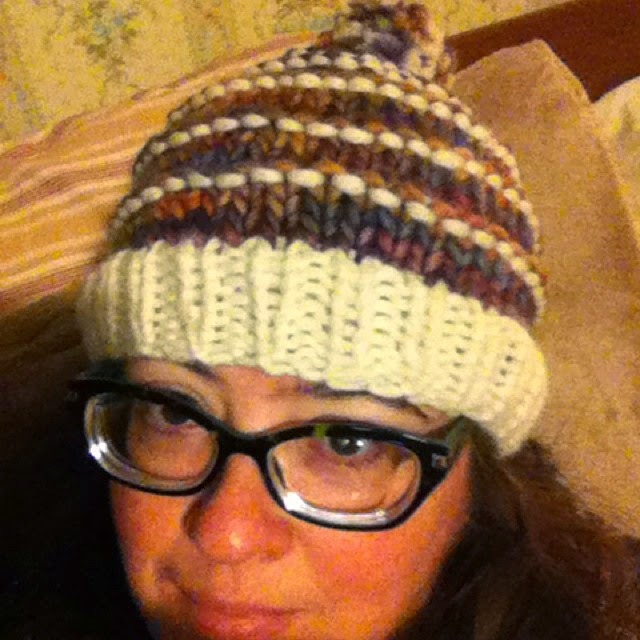 I started the Holly Golightly hat, I bought the pattern in the indie pattern sale on Ravely.. It's that truly awful Bernat Boa yarn..it sheds everywhere! I started an owl from a kit I picked up for 50% off...there are even little tiny plastic needles..
My "Have I Ever Steered You Wrong" started to come together..
And I put a few more rounds on Shark in the Woods....trees! I see trees! But serious mojo issues going on...hopefully that has passed now and I can finish some of these..or at least stick with something! Come on and link up with us! How is your gift crafting coming along? 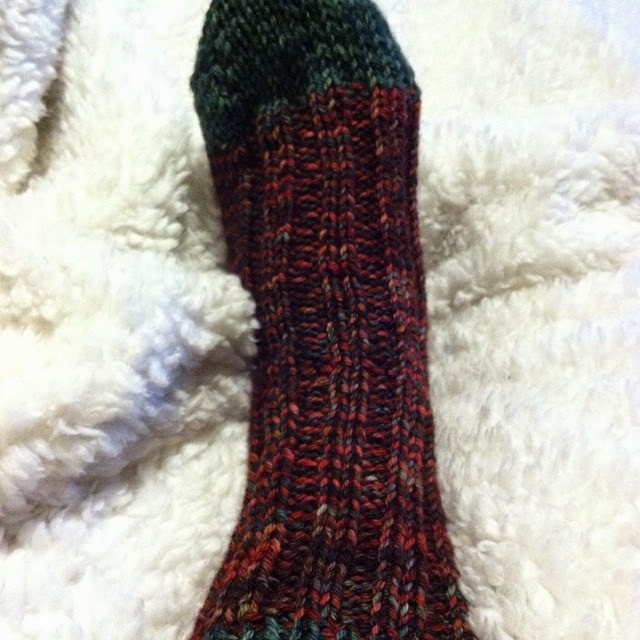 Last night I picked up my Have I Ever Steered You Wrong socks again and was determined to figure out the short row heel....YEAH for me...after two youttube videos..I got it! 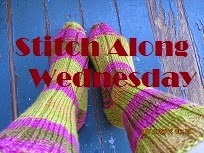 But there is a hole...I plan on stitching that up from the inside...since it's worsted they are going fast! So I have 9 more work days until Santa....and for some reason we do not have a half day the day before the break...yeah there will be tons of learning going on that day! I have a friend who is doing an A-Z of Hamilton, Ontario...and I thought I'll do an A-Z of Connecticut...it's a small state, that tends to get overlooked, but I know there are some wonderful things about it..so first up..
Avery's Beverages in New Britain, Connecticut. New Britain is a town that has seen some ups and downs..but Avery's has been making their brand of soda for 110 years! That is amazing!!! You actually go to their factory and pick out which soda you want in your case. So if you are every in the center of Connecticut, it's an easy on/off of Route 72. And for those not in the US..they are not calling President Obama a donkey...a donkey happens to be the symbol for the Democratic Party (go figure)....they had one for the other guy, but I didn't buy it. And I started a few things....I had some Bernat Holiday Boa yarn I picked up last year and decided last night I needed to make the elf hat...the pattern they gave is knit and child-size, so I'm winging it..